Melanie at My Sweet Savannah made her own wine barrel serving tray. Very impressive Melanie! And speaking of wine… Renee at Cottage and Vine took a trip to Charlottesville and visited my favorite winery in the world- Blenheim Vineyards. After Jared asked me to marry him at Carter Mountain Orchards in Charlottesville, we celebrated with friends at this winery. Memories! Ez at Creature Comforts got me all excited for fall and apple picking with this recipe for Apple Crisp with Pecan & Oat Topping. Mmmmmmm! 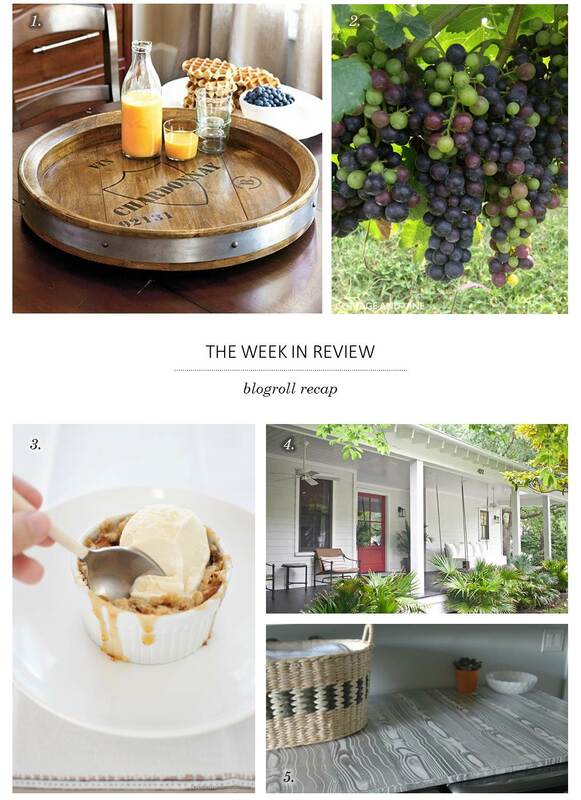 Desire to Inspire showed off this beautiful Charleston home with it’s lovely front porch. Imagining I’m on that porch swing right now. And finally Jenny showed off some mad DIY skills over at the Little Green Notebook with a faux bois paint technique on her laundry room countertop. That should do it! Won’t be long now! When it comes to kitchen decor I have very strong opinions (like when do I not, right?) This is a highly functional room and I believe there should be nothing taking up valuable counter or wall space that doesn’t serve a purpose. That’s not to say your kitchen has to be void of personality or color! Here’s some of my favorite (and useful!) kitchen accessories. Encourage healthy eating and add a pop of color with bowls or platters of fruits and veggies. Whether displayed on the counter for easy access or in the pantry, playful canisters liven up a kitchen and keep your dry goods… well, dry. A solid color works fine but there are so many fun designs out there. Educate yourself on knot tying while you cook, show off your city pride, or my favorite- turn a handwritten note or recipe into a towel by following Emma’s instructions here. Planting an herb garden or succulents on a kitchen windowsill brings life to a kitchen- plus the herbs are quite handy when cooking! I love these little tea tins or tea cups as planters. Though most herbs are pretty hardy, just remember that modern windows are so energy efficient that they block UV rays making it difficult to grow plants in a windowsill. Succulents on the other hand, can grow in the harshest of conditions. After much debate, we decided on IKEA’s NUMERÄR oak countertops for our new kitchen. I think it’s the best budget and design choice and honestly, I’m not worried about performance because I’m the biggest neat freak I know and go out of my way to maintain my things. The warm wood tone will really warm up the high gloss white IKEA cabinets. Remember, this house is over 100 years old. The last thing I want is an obviously modern kitchen. But rather, an efficient kitchen with nods to the house’s history and character. Number 1, we could do absolutely nothing but a mineral oil treatment. Mineral oil is a colorless, odorless mixture. Essentially it’s baby oil without the perfumes. Bloggers recommend the treatment nightly for the first week, then 2-3 times per week for the first month after instillation to get a good moisture/stain barrier in place. And finally, re-oil as needed but typically every 1-3 months depending on usage and humidity. The benefit to this is it’s food safe and water resistant and seems relatively easy to maintain. And the best part is if there is a mark on your counters from a scratch or a pen mark, you just sand the spot down and re-oil. Simple as that. The second option was for those worried about water damage. A product called Waterlox could be applied to the counters for a permanent water tight seal. However, bloggers did warn of a yellowy hue. The third option would definitely give us the color we were looking for and seal the counters water tight. If we applied a stain to the wood and sealed with Waterlox, the counters would look more like a piece of furniture though they would definitely be waterproof. This one is tempting since I am nervous about the color. However, I’m more nervous about the finish. I don’t want our countertops to look like a piece of shiny furniture. I want them usable and durable and natural. Soooooo… option one it is! Dana from the blog House Tweaking gives a fantastic step by step process of her oiling routine. I especially love her kit that she’s assembled. When I know I have the right tools and tested instructions, I know I can handle this! After making sure the countertops are void of all dirt, dust, or crumbs, she wipes it down with the clean damp rag. 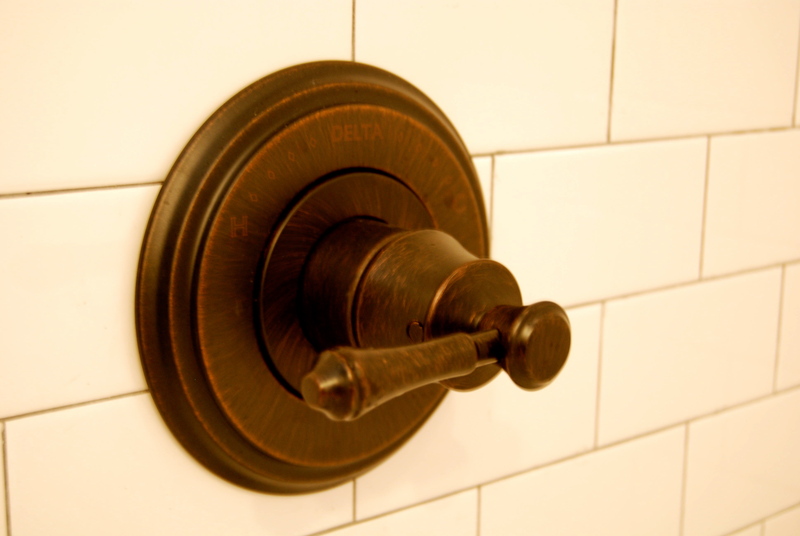 Once dry, a drizzle of mineral oil gets rubbed in with the oiling rags in the direction of the wood grain. After the oil penetrates the wood, there may be some excess to wipe away but especially during the first month, the wood will really soak up the oil. There have also been a lot of reports of the oil darkening the wood slightly so all in all, I’m secure in our decision. Stay tuned for the countertop reveal! We’ve been saying for a while now that in order to move in we need to complete the kitchen, master bathroom, and bedroom. Well last week we made major steps toward finishing the master bath! Now, there’s a lot of corners in this bathroom if you remember the floorplan I showed you here so it’s difficult to get the big picture (pun intended). But here’s an idea of all the beautiful bits and pieces. 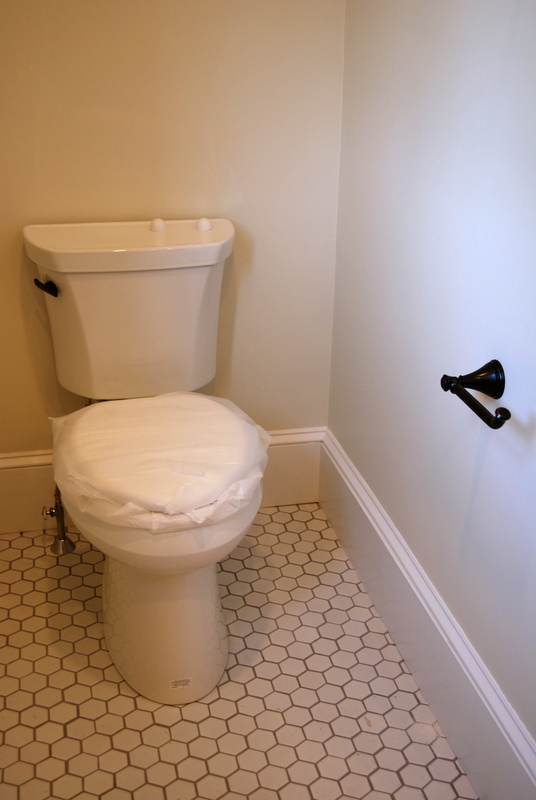 The walls are painted Benjamin Moore’s Soft Chamois. 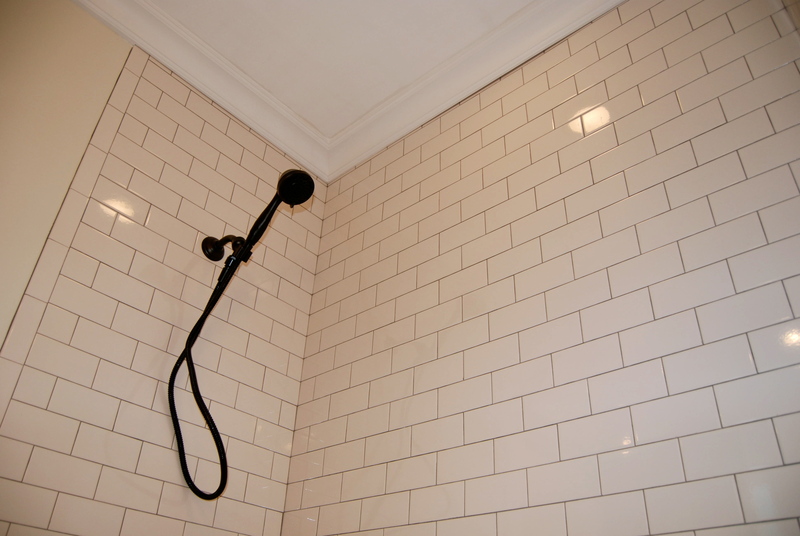 This pale cream color is the perfect mixture between all the white tiles with dark grout and antique bronze fixtures. 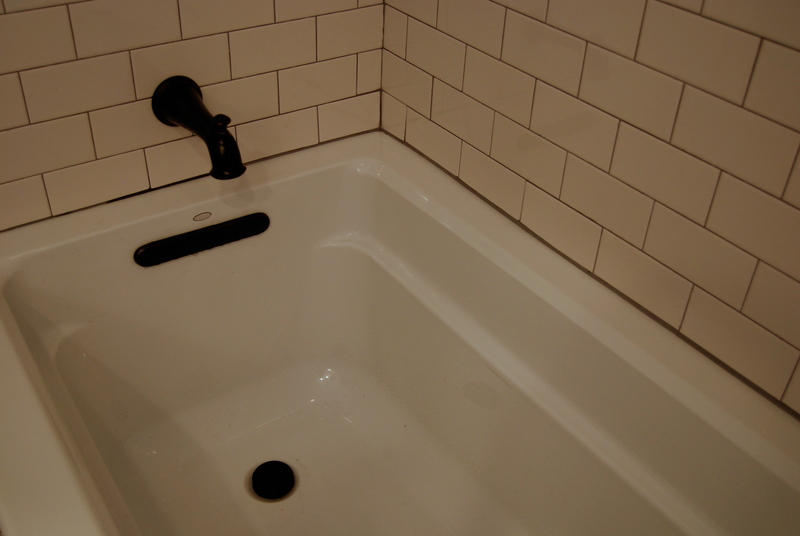 Jared did all the tiling of the hexagon tiles on the floor and the subway tiles around the tub. For a first timer, I think he did a fabulous job. 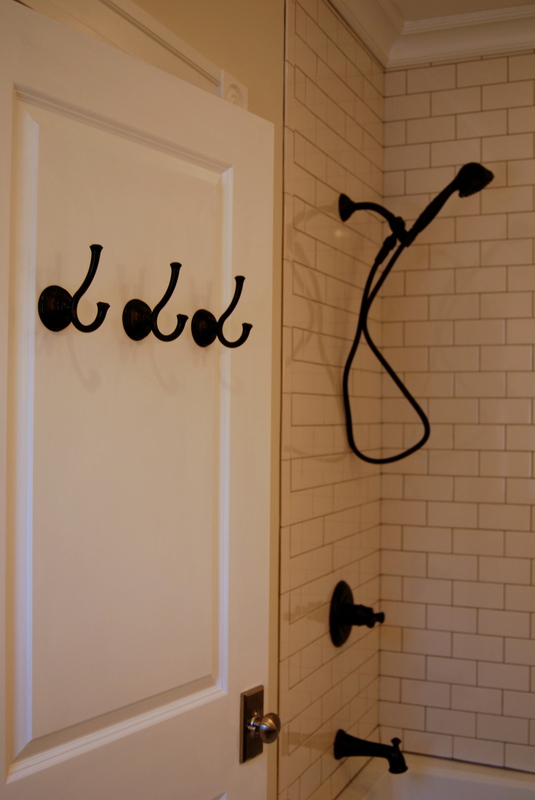 Especially since I insisted on these cubbies in the wall for all our shower products. 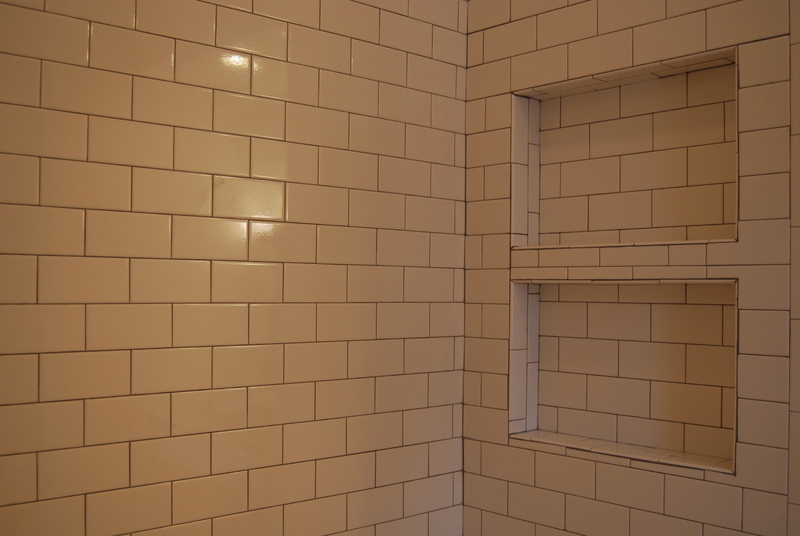 Jared says that there is a definite learning curve but since we had heard so much from our contractors about how difficult tiling is, he felt it was way easier than expected. A straight and level start is key. From then on, it’s just tile by tile, one at a time, and patience, patience, patience. 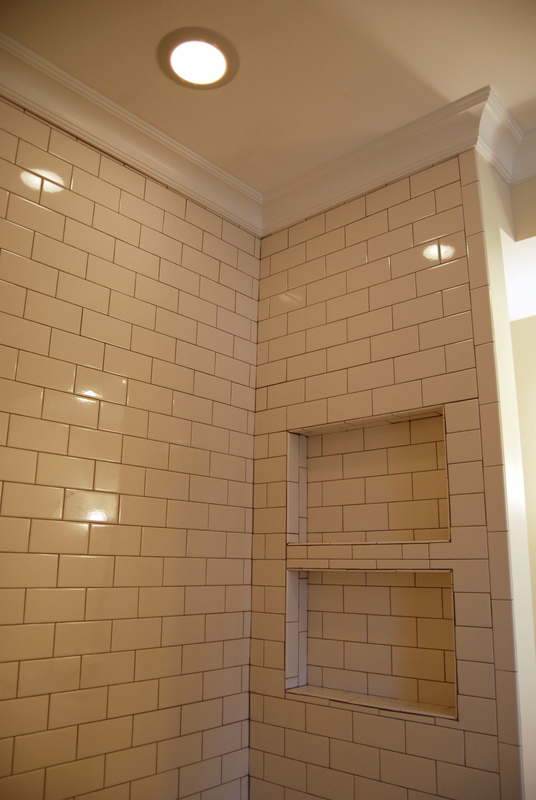 Our white subway tiles came from Home Depot at a great price and the hexagon floor tiles are from the Tile Shop. 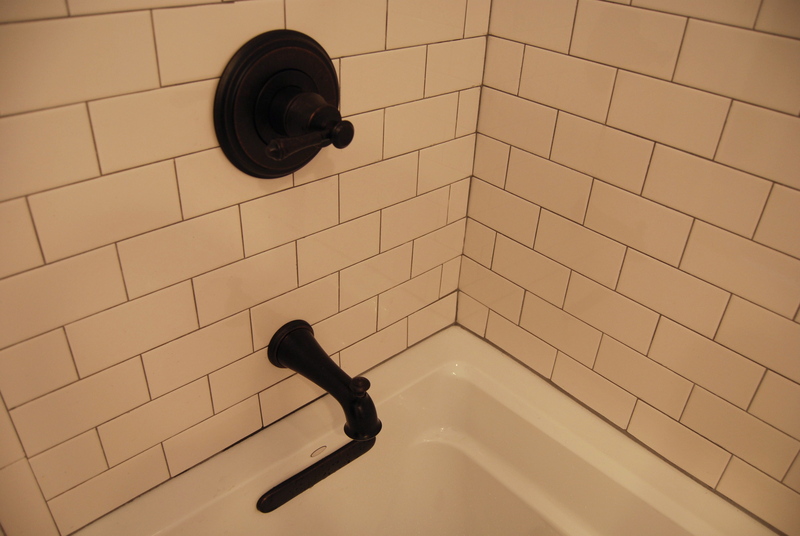 We used a pewter color grout to give a nice contrast I think that along with our antique bronze fixtures give an antique, rustic industrial vibe. I’m purposefully not showing the sink or vanity yet. We’ll have to make a custom vanity due to the space it’s in but we also want to build it custom to use some of the boards from our house that we removed when we took down walls. A reclaimed wood vanity will fit perfectly in this bathroom. For now, my Dad has built a temporary vanity which is hilarious because it’s good enough to go in any bathroom. White table legs with a white laminate top will work just fine now while we move in and build the reclaimed wood one. We have lots of kitchen projects coming to fruition in the next few days. It’s going to be an epic couple of weeks so stay tuned!